I am a real advocate of what I call the ‘meal salad’; multi-sensory, bold salads that are platters of amazing colour, clear tastes, contrasting textures and even a hint of fragrance. I crave salads that invariably cause you to leave the restaurant with a little dribble on your chin because you were enjoying your food and not minding your manners. In short, I want to know I’ve had a proper feed, and not just been fobbed off with lowest common denominator assembling skills. Just because it’s a salad doesn’t mean it can’t be interesting and taste sublime. Being a greedy sort I don’t think that some frilly-pants collection of lettuces, scattering of delicately sliced vegetables and thimble of dressing constitutes a meal. Yet, if you go out and don’t fancy the meat-heavy or sleep-inducing carb options, this is usually what is left. If you are lucky someone might offer it with a miniscule piece of anemic-looking chicken (which I wouldn’t touch with a barge pole) or trio of king prawns (yawn), but the equation ‘woman+salad=dieter’ seems to be behind menu planning at many eateries. And I resent this. The notion (as I imagine it) that salad-eaters are just looking for something to move around the plate so don’t bother making it interesting or filling is insulting and, in my opinion, wrong. Just because I mainly prefer eating plants to animals doesn’t mean my tastebuds and appetite are dead. Sure, if you go up a notch or two you will undoubtedly find something more adventurous, but probably still not filling enough to see you through to supper, or keep you from later devouring that carefully-squirreled away Valentine’s leftover (am I revealing too much?). Are you weary as well of shelling out good money at places where they spend more time planning the wine list than they do the menu? I don’t even bother now. And that’s a bit sad because eating out should expose you to tastes and ideas that inspire and excite. 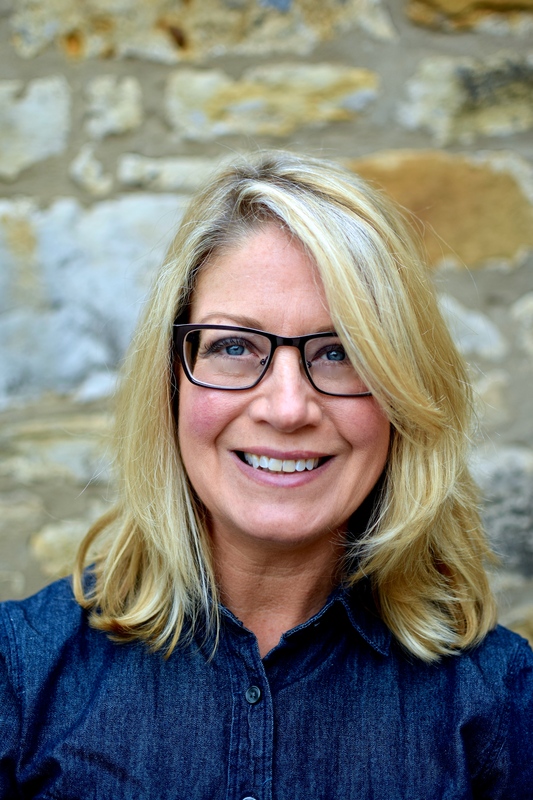 I am a big fan of Sarah Raven – she of UK gardening fame but also an inventive cook – and the au courant London chef Yotam Ottolenghi. Although neither is vegetarian they both display cunning and creative flair to bring out the best in what could be quite pedestrian ingredients. I find that plant-only cooks and cookery writers can be a bit worthy for my tastes, and so I tend to be drawn to omnivores who speak vegetarian as a second language. This earthy, punchy salad takes inspiration from the writings and recipes of my two favourite ‘bi-lingual’ cook-chefs. 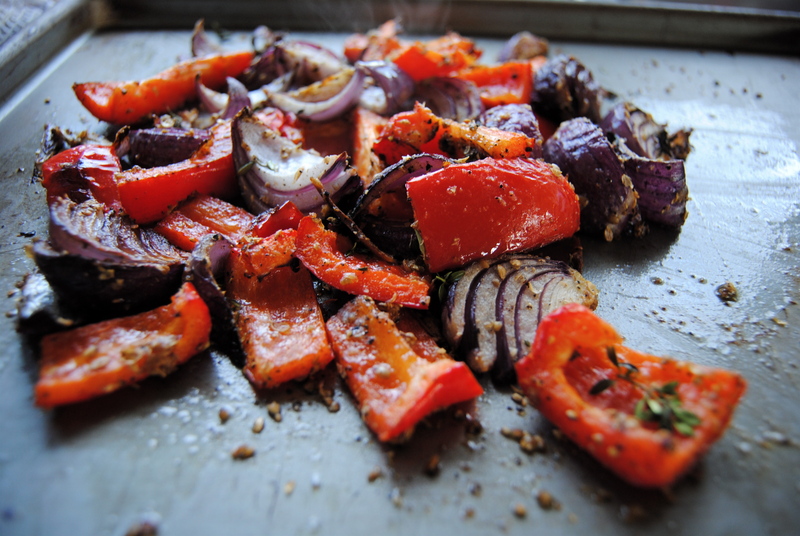 What To Do: Toss the beetroot, onion and peppers in 1 tbsp of olive oil and almost all of the ground spices. Put the beetroots in a small roasting tin and bake at 190C for 45 minutes – 1 hour. When the beetroots have twenty minutes to go pop the onions and peppers onto the tray. 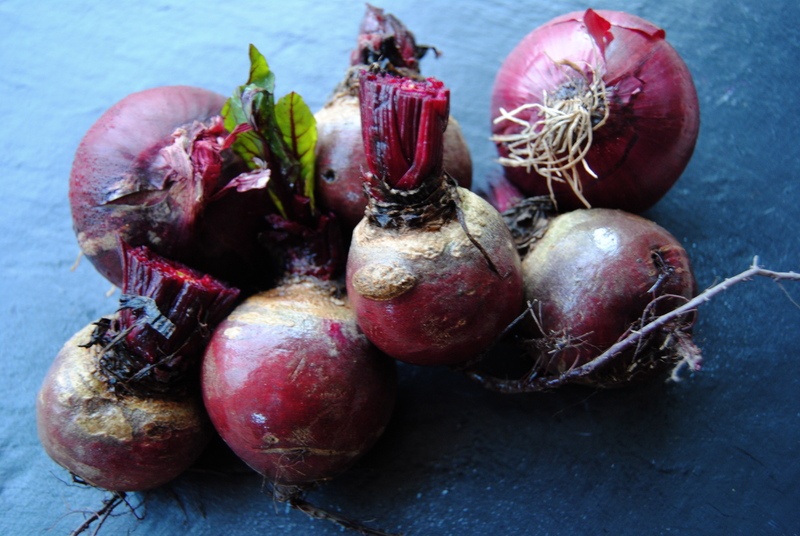 If you are a beetroot fan, you might want to bake a couple of bunches of beetroot for use in other dishes, or for pickling. Anyway, when the beets are tender when pierced with a knife, let them cool and then rub the fragile skins away and slice the juicy beets into big bite-sized pieces. 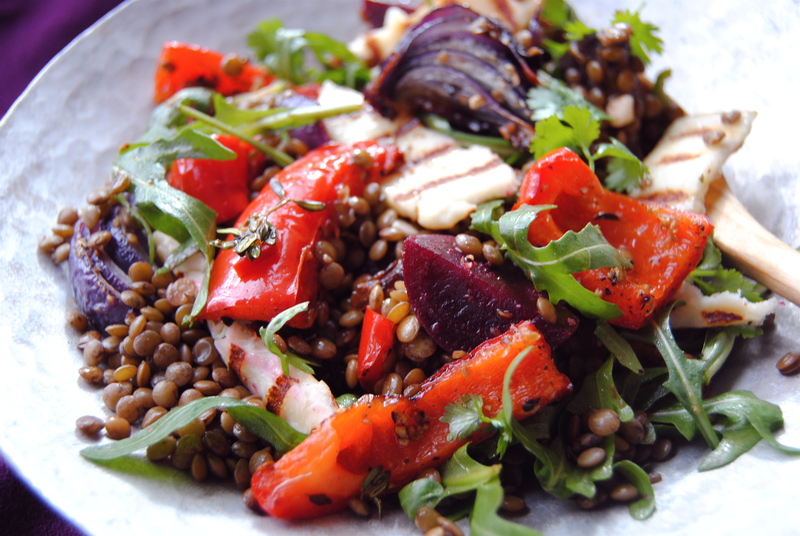 While things are roasting get on with the body of the salad – the lentils. You could very easily use one of the precooked packs of Puy lentils available in many UK supermarkets but they are really easy to sort from scratch and the suggested flavourings really lift the lentils. Pop the raw lentils into a medium saucepan with the bay leaves and cover with the stock and vinegar. Bring to the boil and then cook on a fast simmer (medium heat) for between 20 and 30 minutes. It is hard to give exact timings but check to make sure the liquid hasn’t evaporated at 20 minutes and give them a little taste as well. They should be tender but still quite firm: if your dental work is threatened, give it another 10 minutes. Drain as needed then pour the lentils into a wide pretty bowl to cool a bit. Heat a griddle pan or saute pan to high and slap on the halloumi pieces. Griddle or cook until starting to colour or get griddle marks, then flip and do this again. I sometimes use the ‘light’ halloumi in other recipes but it gets bit dry if you do more than heat it through. Use the full-fat stuff for this one. Remember my rant; this isn’t a diet salad. Add to the lentils the roasted, warm vegetables, chopped garlic, thyme leaves, chillies, lemon juice and zest, whatever amount of leaves you are using, then finally toss together with some extra olive oil and balsamic to taste. Sprinkle in the remaining ground spices if you like, and serve with griddled halloumi or hunks of broken feta cheese, and maybe some flatbreads. Enjoy! I hope you find the cardamom Anne. It’s not a one-hit wonder either: I put the seeds of a small handful of cardamom pods in an old pepper grinder bottle, along with some coriander seeds and black peppercorns, and grind it on to anything I would put ordinary pepper. The smell is fantastic! On no, crivens, I served a wimpy mixed leaf salad, a morsel of meat & a thimble of dressing to some dear friends last night but I can only hope I redeemed myself with the more robust side salad at mains…..a roast aubergine & onion salad with garlic , lemon & tahini dressing with a sprinkle of roasted pinenuts and parsley to finish it. I added a pinch of sumac to the aubergine, a spice I know little about but I guess you can fill me in with any nutritional benefits sumac may or may not have? Your beetroot salad looks fab – its on the next menu! As recipient of said salad (duck breast and salad mache), it was delicious, tangy and certainly the right size to whet the appetite for the main. I want the ‘proper’ recipe for the aubergine and tahini salad please. We all LOVED it! Great evening and fanatastic company. Thank you. Btw, sumac is good for the bowels. As I have expressed before and will indeed feel the need to do so again in the future, you a food Genius!! After eating our way around Siena last week and commiting “Carboside”, Richard and I were looking for something to redeem our souls of sin and fill the vegetable void created but over indulging in pasta, salami and more pasta and salami! This salad saved our lives and re calibrated our taste buds back to the land of the living…taking a step back from a certain cardiac arrest brought on by saturated fats !! Hello Emma. What kind words – you almost made me cry! So kind, and also instructive for me. Because I have a great eater in Miss R I don’t always think about those who may have children who aren’t adventurous (yet), but you aren’t the only one who wants ideas for younger eaters that parents would like to eat too. In my workshops at Maggies we do sometimes talk about such difficulties for the whole family when the person having cancer treatment wants to eat more healthily, so I know it is an issue for many. I will put my thinking cap on and tweak a few more family favourite-type recipes. In the meantime, my fish pie, turkey meatloaf (every kid who has eaten it likes it, probably because of the ketchup! ), smoked mackerel & quinoa fishcakes, and even the sushi made simple (the kids can help) may be of interest. And, for subscribing, I think you just put your email address in the box near the top right, where it says ‘subscribe’, or something like that. Thanks again. Oh! If you have some recipe ideas for me to write about, let me know. I tend to do meat-free things but I will put in a few healthy meat things this autumn.